In this defect, which accounts for 5% of the cases of congenital heart disease, the two main arteries (aorta and pulmonary artery) are connected to the wrong chambers of the heart. This condition is more common among males, affecting 3 boys to every 1 girl. 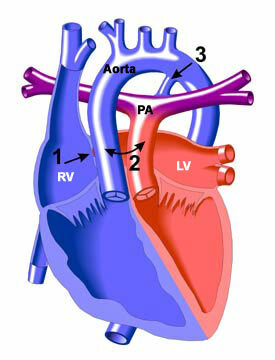 In TGA, the aorta leaves the right ventricle (RV) (rather than the left as in a normal heart) and takes blue (unoxygenated) blood to the body while the pulmonary artery (PA) leaves the left (rather than right) ventricle (LV) and takes red (oxygenated) blood to the lungs. This defect will require surgery, usually in the first week of life.